Our range of products include solar water pumping systems. 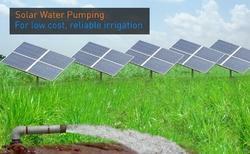 solar water pumping systems provide reliable water supply at low costs. The unique beauty of Orb’s solar water pumping system is that it can work with any existing AC-powered submersible pump – you can just retrofit your existing pump and immediately enjoy more reliable water supply. The solar panels used for these water pumping systems are designed for 25-year lifetime. Orb’s systems are designed to power pumps from 1HP to 20HP, for both single phase and 3-phase.